In February 2015, the U.S. Environmental Protection Agency (EPA) updated its clean air standards for residential wood heaters. The updates, based on improved wood heater technology, strengthen emissions standards for new stoves, and for the first time include previously unregulated new wood heaters. These new standards will not affect wood heaters already in use in homes and emission standards will be phased in over the next five years for new stoves. Current emission limits for certified catalytic wood stoves is 4.5 grams/hr, however combustion technology has advanced so rapidly that many new stoves already meet limits established in the new standards. 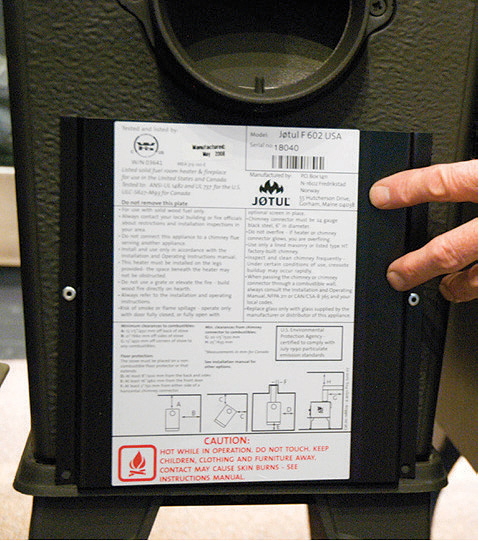 EPA-certified stoves have a permanent label on the back indicating this certification and listing emission levels of the stove. Catalytic stoves use a catalyst to reduce the temperature that smoke will catch fire. The technology works similar to the catalytic converter in your car. When wood burns, gases are released that contain particulates and other volatile organic materials that if not burned will carry heat up the chimney, depositing creosote on the way out. Ordinarily, temperatures must reach at least 1000°F for these gases to ignite, however the chemical coating of the converter acts as a catalyst and lowers ignition temperature to around 500°F. This more complete combustion of the wood enhances stove efficiency and significantly reduces air pollution and creosote deposits. All catalytic stoves have a lever-operated catalyst bypass damper that is opened for starting and reloading the stove. Because these stoves are slightly more complicated to operate, they are best suited to individuals who like technology and are prepared to operate and maintain their stove properly. Highly efficient, burns less wood than other stoves to produce equal heat. Capable of producing a long even heat output. Generally more expensive than non-catalytic wood stoves. Inserts degrade over time and will need to be replaced; with care it can last up to 6 seasons. Insert can easily be contaminated and damaged by burning foreign material, burn only clean firewood, no compressed fuel such as bio-logs, etc. Requires more attention during operation than other wood burning options. Non-catalytic woodstoves are the most popular and least expensive EPA certified stove sold in Alaska. They have a heavily insulated firebox constructed from durable materials and a large baffle system that introduces preheated air into the combustion chamber. These stoves hold the wood smoke and gases released during burning longer. The smoke and gases are heated to high temperatures creating a secondary burn of these elements, reducing heat loss and smoke released up the chimney. While a non-catalytic woodstove cannot match the long, even heat output of a catalytic stove, they produce a roaring fire that is enjoyable to watch. Slightly less efficient, they utilize internal features that create a good environment for complete combustion. Efficient use of wood, low emissions and reduced creosote deposits. Least expensive modern wood stove. Can use wood fuels such as bio-bricks and bio-logs. Operate most efficiently with short hot fires, will not sustain an "overnight" burn. Baffles and other internal features do degrade over time and will need to be replaced. The rise and volatility in prices of fossil fuels, along with associated environmental concerns have led to an increased interest in alternative fuels for residential heating options. Modern traditional wood stoves employ new technologies to increase fuel efficiency and reduce air pollution issues previously associated with burning wood. Other technologies have also introduced more options for the use of wood and wood products for home heating. One of these choices is the pellet stove. These highly sophisticated appliances burn specialized fuel made from compressed renewable organic materials. Wood pellets are manufactured from wood chips milled into wood flour and then squeezed into small pellets resembling rabbit food – often with no additional resins or binders. But while these appliances may be complex in design, they are very simple to operate and maintain. Pellet stoves are also so fuel efficient (up to 90%), they are exempt from EPA emission testing standards. On the outside, pellet stoves often resemble traditional wood stoves, but the similarities stop there. Pellet fuel is loaded into hoppers within the stove; hopper capacity varies in size with the appliance ranging from 40 lbs to 135 lbs. Pellets are carried from the hopper to the combustion chamber by an auger that is controlled manually or electronically by thermostat. Heat output is regulated by the rate pellets are fed into the fire. Fans and heat exchangers move the heat created from the burning pellets convectively away from the appliance and into the surrounding space. Because of this design, pellets stoves often remain cool to the touch and pose less of a hazard to small children than traditional wood stoves that rely on radiant heat. In the right situation, pellet stoves can offer a very reliable and efficient heating option for your home. However, the manufacturing process for the pellets is expensive and because of the explosive nature of the wood flour can be dangerous. Additionally, pellets are not available in many locations. Imported pellets are unsustainable, uneconomical and leave a large carbon footprint. Transporting wood fuel any distance beyond 50 miles eliminates many of the benefits associated with renewable fuels. Exceptionally efficient, almost zero emissions and very little creosote deposits. Clean and easy to operate and maintain; hoppers only need to be loaded daily, or less. Less expensive to install; many can be direct vented, eliminating the need for an expensive chimney or flue. Higher heat output than firewood. Require electricity, will not operate during a power outage. Complex appliance with expensive components that can break down. Recent price volatility of heating fuel, along with associated environmental concerns has increased interest in alternative fuels for residential heating options. Outdoor Wood Furnaces (OWF) or Outdoor Wood-fired Boilers (OWB) are popular in many areas where wood is plentiful and winters are cold. An OWB is a large, firebox surrounded by a water jacket housed in an insulated shed with a short smoke stack located outside of the building or buildings being heated. The OWB burns wood to heat the water (or water-antifreeze mix) that is piped underground to connect to hot water (hydronic) or hot air (furnace) heating systems. Heat is moved from the piped water into the home through a series of heat exchangers and recirculated back to the burner. 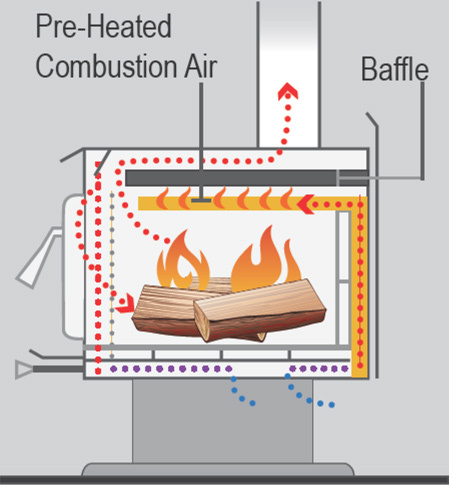 Unfortunately, many OWB are less efficient and create much more smoke than other wood burning devices. In communities where these units have become popular, serious wood smoke air pollution problems are often pitting neighbor against neighbor. Many communities, including here in Alaska have begun to regulate their use and locations. Complete combustion for wood in a firebox surrounded by water is impossible. In order for the gases and other elements released as wood burns to ignite without a catalyst, temperatures need to reach 1000°F; the water surrounding the firebox of an OWB prevents those high temperatures and efficiency of the burn is reduced and emissions increased. Additionally OWB's are frequently mis-used and oversized for the structure being heated. With large fireboxes, (often up to 10 times the size of an indoor, non-catalytic stove) an OWB connected to typical single home is overkill. Smoldering fires and idle boilers lead to large amounts of smoke – and unused heat – escaping up the smoke stack. And, with the short smoke stack, the smoke is released close to the ground where it often lingers instead of dissipating. An OWB is best suited for large structures with high heat loads or multiple buildings in sparsely populated areas. Many early OWB were sold based on false claims and misinformation. Beginning in 2007, certain newer models became qualified with a voluntary EPA program to reduce emissions and increase efficiency. In addition to emission goals, EPA also began an education program to help people select and purchase the cleanest burners available. Before this voluntary program, burners often reached emission levels of up to 2 pounds of particulate matter for every million BTUs produced; new burners that qualify for Phase 2 of the voluntary program have a limit of 0.32 pounds of particulate matter for every million BTUs produced. Burners that qualify for Phase 2 will have a white hang tag and are about 90% cleaner than an unqualified burner. Research existing and proposed regulations; know local codes and required setbacks, if any. Purchase the cleanest, most efficient burner available. Phase 2 EPA qualified burner is preferred (see http://www.epa.gov/burnwise/owhhlist.html for list of qualified stoves). Carefully select burner location, consider prevailing winds, proximity to surrounding buildings and adjacent neighbors. Ensure you have adequate and appropriate storage space for a season's supply of wood (expect to burn 8 to 15 cords annually). Have a professional install the burner and connection to the home heating system. Consider installing a taller smoke stack to avoid smoke released low to the ground. Learn and follow all manufacturers guidelines for operation and maintenance. Burn ONLY clean, properly seasoned (20% Moisture Content) firewood; no green wood, debris or trash. Avoid operating during late spring and early fall – smoldering fires in cool, not cold weather will create excessive smoke, consume more wood and degrade the burner. Can heat large structures or multiple buildings effectively. Don't affect homeowners insurance costs since they are located away from the home. Consume copious amounts of wood – even new, Phase 2 qualified stoves are only approximately 40% to 45% efficient. Produce large amounts of heavy smoke, especially during startup. Generally very expensive to purchase and install. Prone to corrosion and accumulation of debris. We have compiled some PDF resources that can help you make the smartest stove selection for your location and heating needs. © 2008 CES - UAF: This project supported by grant #2004.06301 from a USDA Cooperative State Research, Education and Extension Service Award.